Using a defibrillator can increase sudden cardiac arrest survival chances so why aren't there more life-saving machines around? We look at the campaigns hoping to change this. Most public buildings and even large houses have a fire extinguisher, which is sensible, considering that around 350 people die in fires in the UK every year. Yet, 100,000 die from sudden cardiac arrest - and thousands of them could be saved, if they collapsed close to a defibrillator. But how many public access defibrillators (PADs) have you seen in a high street or public building? While CPR alone (chest compressions and rescue breaths) saves around 9% of people who suffer from a sudden cardiac arrest, CPR and using an automated external defibrillator (AED) increases the chance of survival five-fold to 50%. The computerised machines, which give an electric shock to the heart to return it to normal rhythm, are a crucial life-saving tool after sudden cardiac arrest. This isn't the same as a heart attack, although a heart attack can lead to a cardiac arrest. Most heart attacks are caused by coronary heart disease leading to blocked arteries, which starve the heart muscle of blood, and damage it. A cardiac arrest occurs when the heart stops pumping blood around the body, causing unconsciousness and breathing to stop. Its most common cause is the abnormal heart rhythm ventricular fibrillation (VF), which occurs when the heart's electrical activity becomes so chaotic, it stops pumping and quivers, or 'fibrillates', instead. There are various causes of VF, including heart health problems, lack of oxygen - for example, if you're choking - the use of recreational drugs like cocaine, or losing a lot of blood. 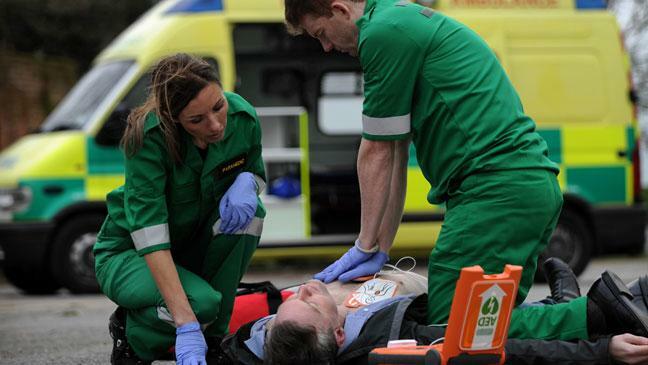 The UK Resuscitation Council says 30,000 people a year have cardiac arrests outside hospital, and warns: "With each minute that passes in cardiac arrest before defibrillation, chances of survival are reduced by about 10%." There are currently a number of initiatives trying to dramatically increase the number of defibrillators available in public areas. Defibs Save Lives, run by the heart rhythm charity Arrhythmia Alliance, is running two public access defibrillator campaigns - Hearts & Goals and the Bernard Gallacher Defibrillator Campaign. The Gallacher campaign, which supports the placement of public access defibrillators at UK golf clubs, was established after former Ryder Cup captain Bernard Gallacher collapsed during a dinner at a Scottish hotel in 2013. He'd suffered a sudden cardiac arrest, but the hotel had a defibrillator and immediate shocks, coupled with CPR, saved his life. The Hearts & Goals initiative began after Bolton Wanderers footballer Fabrice Muamba had a cardiac arrest and collapsed during an FA Cup quarter-final match in March 2012. Muamba was treated on the pitch with multiple shocks and CPR, and although his heart stopped beating for 78 minutes, the prompt treatment saved his life. The former footballer now helps the Arrhythmia Alliance place life-saving AEDs across the country. Trudie Lobban, founder of the Arrhythmia Alliance, says: "Defibrillators present a vital, life-saving addition to any community, school or business. When used alongside CPR, they massively increase the chance of someone surviving sudden cardiac arrest from 5% to 50% or more." The charity works alongside ambulance services to support schemes to provide public access defibrillators, and ensure the best outcomes after sudden cardiac arrests. Paramedic Matt Heward, community response manager for the West Midlands Ambulance Service, says: "Increasing the number of defibrillators in public areas would make a huge difference. Having access to an AED gives the patient a far greater chance of survival. "The more that can be done for the patient prior to the arrival of a skilled paramedic, the greater chance they have of living." Heward explains that AEDs are designed to be used by people with no knowledge or experience, as the device talks them clearly through the process, and all decisions as to whether or not to shock the patient's heart are taken by the machine. Also, after ringing 999, a call centre operator will talk rescuers through how to use the AED. Many ambulance services are supporting the campaign AEDdonate, which aims to increase the number of defibrillators available in public areas around the country by encouraging businesses to buy an AED for their premises, and also donate one to a local public area. The idea is that, as well as the business helping save lives in their local community, they will get good PR from the arrangement, because their name will be emblazoned above the donated defibrillator. Jamie Richards, a former firefighter who runs AEDdonate, says: "The most important thing is to get more of the machines out there - lives are being lost. It's all about time - you've only got minutes to have a chance of survival." He stresses that the first thing a bystander should do if someone suddenly collapses is call 999. If they don't know where the nearest defibrillator is, the location will be displayed on the ambulance call centre screen, and the 999 operator will direct the caller to the AED, and give them the access code to the box (sadly, AEDs in public areas need to be in a secure box with code access, as in the past they've been stolen or vandalised). The AED system talks to the person who opens the box, telling them what to do, and even counting how many times the rescuer needs to do CPR. Ambulance staff on the phone will also give advice. The British Heart Foundation (BHF) says there's limited information about the current rate of bystander defibrillation outside hospital, although one study in the South of England reported it in just 1.74% of cases. While this low figure will be linked to lack of access to a defibrillator, and possibly not knowing what to do, the BHF stresses that while waiting for the emergency services and a defibrillator, delivering CPR increases survival chances after cardiac arrest because it keeps blood circulating to vital organs. It also increases the likelihood of the heart remaining in a 'shockable' rhythm rather than deteriorating to a 'non-shockable' rhythm (flat lining). The charity says there's currently no central system for mapping the location of all public access defibrillators, and it has recently committed to fund a national PAD database. Julie Ward, a BHF senior cardiac nurse, says: "After a cardiac arrest, every minute without CPR and defibrillation reduces someone's chance of survival by around 10%." She stresses that while a rescuer should check if there's a defibrillator nearby, if there is one, they shouldn't stop CPR, but should send someone else to get it. The BHF has funded over 13,000 defibrillators in the community since 1996, but Ward says this is just the start. "We want more PADs to be available in the places they are most needed," she adds.